The following five short stories, or �opuscules� as my father has chosen to call them, were all written long after we had left Rannoch. An incident or comment would inspire my father to write. A paper copy would then be dispatched to me for my family archives as my father assumed that I would type the story and sent it on by email to other family members to read. I have scrupulously kept everything, my training as a historian influencing me and, I must say, thank goodness, for otherwise they would likely be lost. My father never kept any copies for himself and I have not asked whether Isabelle, Mick or Kasia kept theirs. The first opuscule, �An incident on the Allalin�, describes an event in the summer of 1960 which was such a shock that it was fifty years before my father had the courage to write about it. 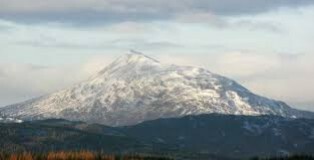 The experience of almost falling to his death left a deep impression on him and influenced his conduct in the mountains thereafter, whether alone, with colleagues or with the Mountain Service at Rannoch School. I actually had two versions of this story: the original and a second more detailed version. As my father preferred the original, we decided to keep to this version, but added some paragraphs at the end from the second version. The second opuscule, �A Rannoch Memoir�, is a copy of my father�s text in the �Rannoch Anthology, 40 years on�. I imagine most former Rannoch School boys have their own copy of the Anthology, but many other readers do not. My father deliberately wrote this text for those who were at Rannoch with him in the 1970s, who knew who or what he was referring to and would smile at the mention of certain names or incidents. I have already explained some of the anecdotes he wrote about, others will follow in Part 3. The third opuscule, �The chocolate �clair�, gives an idea what my mother was like at Rannoch from the mid-1970s and the consequences. It describes a car accident my mother had one winter�s day. Finally, the fourth and fifth opuscules �Rannoch revisited� and �The last chance� deal with understanding and accepting changes at well-known Rannoch fishing haunts as well as the limitations of old age with good humour. At some point, we all have to acknowledge that our physical abilities have diminished and former pastimes no longer cause us pleasure. Fortunately for you and me, my father�s mental abilities remain undiminished. Long may it last! An estimate of Dave�s degree of fitness would fall within two strict parameters: he was fit enough to play rugby in England but not fit enough to play it in New Zealand. This was not really important. More to the point, being a New Zealander he was good on snow and ice. I must explain that in 1960, with Ed�s1 great exploit fresh in the mind, New Zealanders were good on snow and ice whether they had ever been on snow and ice or not. They just were. Nowadays with the benefit of science we would explain this by their D.N.A or �Nature not Nurture� if you like. Put more simply: they were good on snow and ice in the way birds are good at flying or moles good at digging. So that Whitsun half-term we went to the Lake District, I took him up some of the usual Langdale trivia and the Alps were to be our next stop. I took the train, complete with Swiss wife and baby daughter, leaving them with in-laws, while Dave hitch-hiked. Something went wrong because he arrived in Zermatt a few days late, while I got thoroughly bored and frustrated, since mere walking is something one obviously does not do, except to get to a climb when there is no other way. This perhaps explains the impatience and enthusiasm with which we left the T�sch H�tte in the direction of the South Ridge of the Allalin. I had always been an English conservative in the matter of belays, but I also secretly admired the Gallic panache with which the French dispensed with such facilities. This was the day when we would move together �a la fran�aise�, using only half of the rope. It was exhilarating, the climbing was easy, the weather was superb and so was the vista to the right where a sea of clouds led the eye to some distant Bernina mountain or something, beneath the risen sun. I have since spoken to some people who knew the Allalin. Without exception, the next section has remained vivid in their memory. The route leaves the ridge, bears right, and crosses a very steep hanging gully in a place of quite extreme and intimidating exposure. The fact that most people cross this after the sun had been at work on the steep snow must impart a feeling of insecurity. 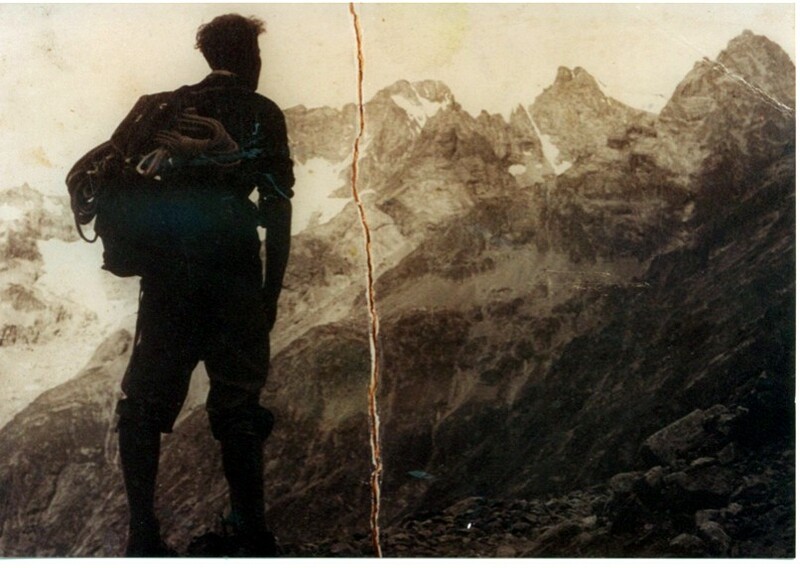 Dave was a New Zealander, but he had not been to Chamonix in 1958. It would, however, be wrong to say that he was off as soon as he stepped on the snow. The hissing snake proves that he was about half way. There was, of course, not the slightest chance of my being able to hold him. So, how does it feel when all common sense, all your climbing experience, all patently obvious evidence, points obviously, indubitably, suddenly, that this is the Great It. The It with a Capital Full Stop. It seems she2 wasn�t quite ready for holding a falling leader, but she held me as I hit a sloping slab, and watched as the little guide � Carneddy Climbers� Club, pretty green hard covers, Moulam, if I remember - jolted from my right pocket by the jerk with my upside-down position, fluttered gaily like a demented butterfly to the screes. She got a finger burnt, but otherwise it was most enjoyable. I suppose this is the point of bungee jumping. We did something else and the next day I did some of my best climbing. The Allalin was different. Very. I saw the smile of my ten-week old daughter. I have recently learnt that children of that age do not smile at you in the way we would expect. It seems they smile at anything that moves, but I didn�t know that at the time. I saw that smile and a great longing come over me for one of these bloody great belays that are such a feature of the East Face of Tryfaen. But of belays there were none, only the useless ice axe, the realisation that there was no chance whatsoever of holding Dave, and the hissing snake of the snow sodden rope disappearing round the shaft of my ice axe. I dived head first at some rock which stuck out a few inches above the snow some fifteen feet below. Two things surprised me: the violence with which my chin struck the rock and the gut wrenching tug of the rope at my midriff but, totally unexpectedly, that was upwards not downwards. As we fell, the rope, slicing through the surface of the snow, found sufficient indentation behind my rock to arrest our fall. Moreover, that was sufficiently rounded for the rope not to be cut. A moment of pure terror followed. Dave was on the rocks forming the true right of the gully. I clambered onto the rock, ready to drop off again on the side opposite to his should he fall. He climbed to my level where he found a belay, the only one �for miles around.� Digging my arms up to my armpits into the snow, I climbed up to my ice axe, stuck at a crazy angle above, and with infinite care, belaying frequently, we made our way up the gully and onto the ridge. As soon as we found a gully on the Zermatt side, we carefully went down that. On the glacier, I put my foot through a crevasse, something that has not happened to me before or since. In the evening, in the hut, I started shaking. It was quite funny. I was talking, cooking and eating quite normally and shaking at the same time. There were some climbers from Basel. They knew the Allalin. One told me: �You are lucky. From now on, every year, you will be able to celebrate two birthdays!� Swiss humour for you. At the time, with the arrogance of youth, it felt important to tell myself that it was my presence of mind, my master he-manship which had saved us. Now, I doubt it. As in Whymper�s description of the Matterhorn accident, in such situations one grabs at anything solid. In our case, the only such was fifteen feet below me. I did not know what was to happen. Nevertheless, had I waited for the great jerk, the conditions in which our fall was arrested would not have been fulfilled. We fell with the profile of a snorkel, with Dave at the mouthpiece and myself at the air intake. So, how much time did I have for my deliberations is difficult to say. To my knowledge, there are no reliable scientific data on the acceleration of falling New Zealander rugby forwards. A second is actually a very long time. Less than a second is the probable answer. We went to the Zermatt museum. Worth the detour as the Michelin guide would say. It contains items of clothing, boots etc. of people who had fallen, with the characteristic tears and damage caused by passing rocks. I noticed with satisfaction that the front of my anorak, with my rock�s depredations and liberally embellished by dried blood from my chin, did not disappoint in that august company. Ever so long, I have felt that I should write an account of the incident, but the very thought was intimidating. I preferred to leave it and get on with my life. About twenty- five years ago someone asked in one of the mountaineering journals (Scottish Mountaineering Club Journal, I think) for people with extraordinary close shaves � I can�t remember the exact words � to describe them to him. I thought of doing so but couldn�t face it. Then, at the age of sixty-five, I started writing. First, a biography of a very interesting great great great grandfather of mine. Then, a book in Polish on a similar subject, then a short Orwellian satire about human cloning and selective abortion. The Allalin incident was to be forgotten. And now there appeared in the Sunday Telegraph a request from Dr. James Le Fanu for news from people who have been saved �by an extraordinary stroke of fate�. I knew that if I didn�t write now I never would and, what�s more, my word processor had just been mended. With the writing, the doubts returned. Am I really alive? Why am I alive? Is it a mistake, a muddle in the eternal order of things? And how about those three of my children who were born after 1960, and the four3 relevant grandchildren? I seem to be alive. Not only that, but there would seem to be a future. I have pills for my diabetes, inhalers for my asthma, priority in flu jabs, cream for my psoriasis, and evening primrose oil works for my arthritis. I have three score years and ten well under my belt and plan to write a book about the thousand years of Polish � Jewish cohabitation, while the vigneron in Burgundy told me not to drink his wine before Christmas 2002. Some of the wines in my cellar need keeping longer. For many years, I had a scar on my chin where it had hit that rock on the Allalin. I had a look in my shaving mirror the other day. It is now very faint but still there, if you know where to look. 2 �She� is not my mother, just somebody my father happened to be climbing with in Wales. 3 Dr James Le Fanu is a medical journalist who has weekly columns in the Daily Telegraph and the Sunday Telegraph. It was all Richardson�s fault of course. I wonder whether he knew that deep in my psyche there was a sort of Scott in the Antarctic gene, one which would incline me to undertake such an idiotic journey as trying to reach Ben Alder Cottage in the Land Rover. I knew, naturally, that it was absurd but the continual encouragement was spellbinding; �Look, this way sir! � and after that over that bit of heather!� The end came not quite as expected. We all leaned forward as the vehicle tipped slowly and gracefully like a ballerina taking her bow to thunderous applause after a more than usually successful performance of �Swan Lake�, and with a gentle squelch sank right up to its axle into the bog. It was quite different from getting stuck in the conventional sense as the reader conversant with getting stuck will doubtless appreciate. No matter. Next day twelve good blokes and true came to survey the situation. Brawn, not too much brains, but what invention! Amid much theorising about levers and points of contact, the Land Rover was extracted without the help of another vehicle or some farmer�s tractor, which would have been cheating of course. It is typical that after almost twenty years away from Rannoch, it is the glorious mishaps that remain in the memory. Not just mine but also others. I was not the first to lose a Land Rover temporarily. That honour belongs to Wielochowski, the even madder Pole who once abseiled down the main fa�ade to retrieve some trivial object from Piaaaahno�s locked room. Then there was Roff who lost a whole flotilla of canoes in some miserable spot to the west of Laidon. There were also the impersonal mishaps. Like those heroic Victorians (here Gordon of Khartoum springs to mind) who stood their ground to the last man against overwhelming odds. It was so glorious and appropriate for the cutter to succumb to a fire started by a couple of smokers. Apart from the Mountain Service Land Rover, the cutter was the last vehicle, if one may use that expression for something not even amphibian, the last vehicle of real character. Much as I loved the Mountain Service Land Rovers, there was nothing that inspired such affection in drivers as the �New Green Bus� and the �Blue Bus�. Both the Green Buses were roughly of similar age and you would need the Antiques Road Show to tell you whether it was the early thirties or the late twenties when the Green Buses first saw the light of day. Be that as it may, the �New Green Bus� was definitely the connoisseur�s choice. No racing driver at the wheel of his Maserati has the power and exhilaration like a god on some distant Olympus, which you felt as you double declutched and pressed the magic accelerator! The �New Green Bus� looked like something out of one of these old photographs one sees in pubs of people alongside their vehicle struggling up Hard Knott or the Devil�s Elbow in the days when roads had hairs on their chest. Only one of us had the nerve to take the �New Green Bus� to its full speed. What a sight it was to see Huggins thunder at 75 m.p.h in it past the Loch Tummel Hotel! Were we all mad? I think most of the historians were mad. There was something Napoleonic about those such as the late much-loved Haines, or Claude for that matter. Are Rannoch historians still Napoleonic? Have they now succumbed to politically correct thinking? Actually, many of us were not mad. Alec Cunningham springs to mind. His expeditions were so well and meticulously planned that, at least in my time, nothing ever went wrong. As for one of Alec�s expeditions, horror of horrors, being late for Sunday Chapel was about as likely as an elephant taking wing and joining that eagle in its patrol of the skies above Camghouran. Written mid-1990s. Printed in �Rannoch Anthology, 40 Years On�, Published in 1999 by Rannoch School. Edited by Alec Cunningham and Daphne Banks. The powerful blow rocked me in my chair, with only the cupboard on my left preventing me from ending up on the floor. Theres pointed to the solitary chocolate �clair adorning the Fusion Caf� dish purposefully placed well out of her reach. It would be wrong to say that Theres punches beyond her weight; she has regained some of that recently. More accurately, she punches well beyond her gender and punching is the way of expressing her needs and desires. From her recumbent position, a right hook would have been theoretically possible but her preferred manoeuvre is a mighty prod of the elbow, with the arm rest in no way incommoding her. I ascribe these attributes to Theres� origins: she comes from good Swiss farming stock, with the added advantage that her mother is from inner Switzerland, once home to the mighty William Tell. And so, I gave her yet another digestive biscuit, in the hope of a few moments of respite. Like a cricket captain, satisfied with having got most of the opposition out for relatively few runs, I was basking in the satisfaction of having confined Theres to just one cake. Like fears of a determined last wicket stand, I feared Theres� sheer toughness. As I sat, barely conscious of the entertainment, the memory came to me of an incident over thirty-five years ago. We lived then in Rannoch, in North West Perthshire technically, but really in the Highlands. There were two good grocers in Kinloch Rannoch, but for more serious shopping one had to go fifty-five miles to Perth. There were two ways: either along Loch Tummel and Pitlochry, or over the �Goat Track� and Aberfeldy. The �Goat Track� was a typical Highland single-track road with passing places, winding under Shiehallion at about a thousand feet. It was one of these dreich early winter days: steady if moderate rain with the probability or rather certainty of snow further up, when Theres announced her wish to go to church in Crieff. I had my misgivings as Crieff necessitated the �Goat Track�, but I knew my remonstrations would not bear fruit and anyway Theres was an excellent driver, familiar with local conditions. And so she left. Two hours later came the message� Theres had come off the road, but she was all right and waiting at the farm under Shiehallion. �Come off the road?� I imagined that she was either in a ditch or even just unable to make progress because of a wheel spin. I hurriedly got the Mountain Service Land Rover, threw a towrope in the back and set off. As I drove up the hair pins the rain turned to sleet and, as I passed the little quarry where we used to practise the technical stretcher work, there was about an inch of snow on the road. One single set of tyre tracks were clearly visible in the virgin whiteness. Obviously, no one else had come this way yet or, for that matter, would have been keen on coming. And so I drove along wondering what my quest would bring, along that grey and lonely road following the depressing tracks. We were all familiar with the �Goat Track�, it held no surprises or abysmal precipices, but it was a mountain road. At one point, there is a sharp turn right followed at some distance by a gentler turn left and at some more distance there was the farm on the left with the mountain on the right. As I approached the sharp right turn I saw it quite differently from usual for there were the distant hills, the distant valley floor and �. nothing in between, while without any sign of skidding or even hesitation the tracks continued straight over to whatever lay beneath. Now I knew what was meant by Theres being off the road all right, and I approached the bend more with curiosity than the dread and horror which I would have obtained if the message had not had the element of reassurance. The car lay twenty feet down, upright, and jammed between the snowy mountainside and the tops of a plantation of young trees, probably Norway Spruce. It amazes me now that when I picked her up at the farm I did not ask Theres what had happened, but that is easy to reconstruct. To end up the way it did, the car must have done at least one sideways somersault. With the driver�s door firmly jammed against the mountainside, Theres must have got out via the passenger door, fighting her way through the tops of the trees, down and then up to the road. She walked of course through the snow to the farm, no scratch or bruise though we did not have seat belts then. A powerful thump brought me to the here and now. The chocolate �clair still lay on the dish, solitary and despoiled of its siblings long since eaten. What the hell! After all, she had had five cakes two months ago and survived. Two cakes would, all things considered, not be a bad score. My hand moved, not tentatively but purposefully, towards her desired object. The osprey had seen something that I had instinctively, over the past couple of hours, come to feel wasn�t there � trout. Its circling optimism was infectious, and gave me hope, but I was not to know with what justification. Two yobbish and very ill-mannered seagulls came to mob the osprey, which flapped its wings angrily and flew off in the direction of its secret island hideout a few miles off. I wondered how many generations separated it from the one who had been my fishing companion on Finnart one evening twenty years earlier. I was visiting Rannoch after an absence of fifteen years, perhaps to get it out of my system, perhaps out of curiosity. Much had changed. New people had taken over old hotels and shooting lodges, but one thing hadn�t changed. Dunalastair Reservoir, once one of the very best trout lochs in Scotland, was fishing just as badly as it had been in the late 1970s. It had been the victim of a well-meaning but disastrous, and very instructive, policy of trout management, or mismanagement. 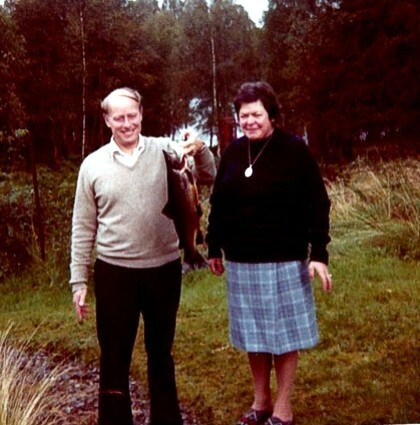 In the early 1970s Dunalastair was the home of plentiful and magnificently conditioned trout, averaging � pound, which tantalized by only feeding every few hours, and ultimately gave the enormous satisfaction of trout which are not too �easy�. Sometime about 1976 a local fisherman was playing a half pound trout when something big, nasty, strong and brutish came and swallowed it. General consternation. The pike had got into Dunalastair! The attitude of Scottish fly fishers to pike is similar to that of Scandinavian mothers to wolves. The wish to exterminate is endemic. And so, extermination was proceeded with. Nets were set and vast quantities of vast pike were caught. The effect on the trout was magic. The following season the trout had doubled in size and I must admit to having been the beneficiary on several occasions. The heart of even the most resentful fishing widow melts when confronted by a two and a half pounder for the pot at 11 o�clock in the evening. The next season I mostly fished Rannoch, but on Dunalastair the trout had further increased in size and people were catching four pounders. And then, in the third year everything changed. Even the most experienced fishers were suddenly experiencing blank days. To me it was obvious what was happening. Large pike do not only feed on trout, but also feed on small pike. By removing the large pike with nets, ideal conditions were being created for two classes of fish: large trout and small pike. The former came to have less and less competition for food as their peers got caught, while competition from smaller trout was non-existent as these were all being eaten by the smaller pike whose numbers would no longer be controlled by the larger ones. I have now been told that pike netting had stopped some years ago, but obviously some problems remained. The Loch Rannoch Fishing Improvement Association runs a hatchery admininstered by Eddie, a retired fishing friend of mine. Large numbers of trout are put into Rannoch, and two thousand into Dunalastair in the autumn. I have doubts about the value of this. One day I was kindly taken out by a boat owner on to Loch Rannoch, where I had had my own boat years ago. It was particularly nostalgic, but even here one thing had changed. In the process of catching about seven hundred trout on Rannoch, and that took a long time, I had never ever before seen a cormorant. In fact, I had only once seen another cormorant on a Scottish freshwater loch. It was on Suirdalain, in the shadow of Suilven near Lochinver. The awful truth began to dawn. What these two lochs had in common was that they both contained stocked trout. The conclusion was obvious. Cormorants don�t feed on most Scottish lochs because they can�t catch wild trout. That bird galivanting on Rannoch was gorging itself on Eddie�s fish! This vulnerability of stock fish to predators made me think of the 2000 released into the pike infested waters of Dunalastair. Surely these convent-educated virgins don�t survive till Christmas, let alone next season. The occasional trout caught must be wild fish. Worse, for every trout eaten by pike there is a pike not eaten by pike. For two thousand trout � . The conclusion this time is positively macabre. 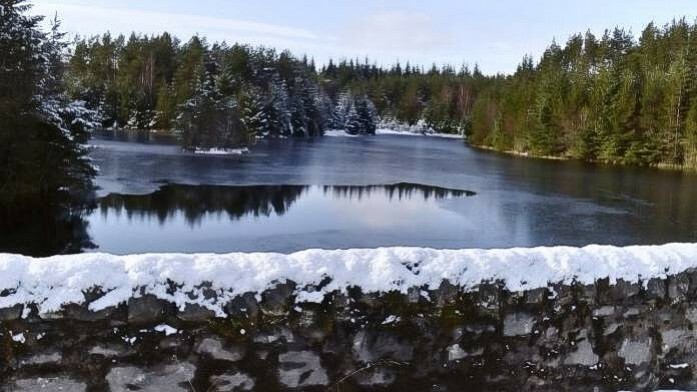 There are two forestry reservoirs above Rannoch School at Dall. Although beautiful, the fishing in the bigger one was never very good. The trout were small and tended to rise short. But the hidden, smaller one was different. It was �L� shaped and so small that one could almost cast across it. Curiously, although it was a thousand feet up, it fished well in April, particularly in a snow shower. Useful, as it was only half way through May that Loch Rannoch would explode in a frenzy of trout activity to coincide with the new verdure on the silver birches. The �Small Res� had good six-ounce trout, and was never bothered by immature fish. Then, one very windy September day, two Rannoch boys caught seventy trout. It must have been virtually the whole of the adult population of the small reservoir. The fishing never recovered. Small and immature fish, rising short, abounded. It taught me that, contrary to the beliefs of highland gamekeepers, overfishing results in the diminution of the size of fish. I skirted round the �Large Res�, struggling though bushes. Its level had been much lowered to comply with some fatuous Brussels ruling, making it ugly. The level of the �Small Res� was, however, the same. Only the magnificent vista to the wild snows of Ben Alder in the north had disappeared behind a canopy of now tall conifers. But my favourite casting spots remained clear. There was an immediate response. After an hour, I had six fat adult trout, but they were small, barely 4 oz., and a different, lighter colour. They had also been too easy to catch. We change, the world changes, memories do not translate into reality. This side of Keswick on the A66 there is a straight stretch of about two miles of single track road. As you drive home after a day on the hill you see the Pennines, with Cross Fell straight ahead. I have noticed how the sight is always different according to the time of year, weather, light and other factors. Quite different and varied colours above all. In opposition to these vistas, regularly, I have now for many years, perhaps only faintly in the past, but increasingly vividly latterly, experienced on this stretch of road a recurring thought questioning how long exactly all this will be going on. I don�t mean the matter of longevity, which presumably interests other older people, I mean this feeling of satisfied repletion of the senses, this comfortable tiredness which is such a feature of one�s feeling after the completion of a day on the hills with coffee and scones in a valley tearoom at the end. Unlike my persistence in hill walking I succumbed some ten years ago to an attack of common sense, of accepting my age with equanimity, of doing the right thing, of accepting my limitations and my being accident prone, and I sadly put away my trout rod and other associated equipment. You may not know the boggy peat track, about eight miles north of Lochinver along the coast, which heads off into the hills eastwards. About an hour�s walk brings the impatient trout man to some lochs, home of golden sizeable trout, not too dour i.e. not too averse to being caught, a location which I visited virtually every time I used to come to Sutherland. On this particular occasion, I had fished an hour or two. I cannot remember whether I had caught anything, on reflection probably not, and I stopped for lunch. No fisherman, however dim-witted, will step on his rod, but I had put that down so carelessly that the cast of flies attached to the end of my line became entangled in my leg as I moved expectantly in the direction of my sandwiches and thermos, while the barb of one of the flies cut through the thickness of my tweed climbing trousers, becoming firmly embedded in my thigh just above and to the outside of my right knee. You will now appreciate my predicament. A trout fly digging into one�s thigh is bad enough, but the fly being attached both to my leg and to my trousers offered a difficulty of a totally different order. A good hour�s walk back to the car meant legs moving, and as legs moved so did trousers and as these moved so would the fly embedded in my thigh. To fully appreciate the irony, you will realise that even the seemingly obvious solution of taking the trousers off and proceeding car-wards as a kind of �Sans Culottes� of the French Revolution, was not open to me since I was firmly attached to trousers by a trout fly. Human invention has few limits and so it proved on that occasion. I happened to have scissors which can be useful in fishing and I cut the material round the fly, enabling me to return not without discomfort but that reduced to bearable levels. The doctor in Lochinver had pliers for these situations, cut the fly and pulled it out in the same direction as the barb. My renounciation of any more fishing proved to be only temporary. In retrospect, it was the whole ambience of fishing while staying in a caravan that had paled over time. The thought of a fishing hotel with full English breakfast served prior to the day�s rigours proved too much, and first Scourie Hotel, latterly Inchnadamph, where mine host refuses to have any televisions in his hotel, or to sell bottled water to ignorant southeners, became my yearly Meccas. Thus, unlike in the matter of trout fishing, my fell walking never experienced the interference of unhealthy common sense. On the contrary, I have become over the years increasingly obsessed with keeping it up from fear that once lost, however temporarily, one�s condition will never be regained. So, particularly vivid has been my regular A66 thought on the last trip of every year, sometimes in November, faced with the prospect of no return till February: would I still be capable in three months� time? To take this historically I shall go back about fifteen years. For some time, we had known that the most cost-effective way of visiting the Lakes was by leaving the house at seven in the morning and returning the same day. In those days Theres came walking with me as one would expect. Gradually she found this more difficult and I remember that her last walk was Catbells. Then came an equally happy period. We would drive over to the Lakes, I went walking while she pottered about in the valley, in the company of a �Hello� magazine, and visited the local tearooms. This happy time came to an unexpected end which stopped our arrangements. It was one of these sunny February days, precursors of spring, not too cold but with an obvious night frost to be expected. As I left her in Rosthwaite, she seemed slightly different, apprehensive in retrospect. I went off somewhere or other and was back four or five hours later. As I arrived at the car, there was a police Land Rover, Theres in solitary splendour in the back. She had gone off into the hills looking for me, in quite a different direction from where I had gone. Although it was February, there were, as it is usual on these kind of days, plenty of people around. Some met her, realised she was not quite right, and accompanied her to the nearest hotel in Stonethwaite. The hotel rang the police, Theres remembered our address, and the police found our car from this information. Two months later, Theres wandered off at Castle Eden walkway. We had had an arrangement where she went on a shorter walk than mine, meeting back at the car � police, helicopter etc. I actually wrote to Frank Cook1 about how the fragile pensioner in question was saved, saving thereby the actual helicopter which was due to be abolished. And so, to the final movement to this story: the excellent respite arrangements of Stockton social services, and my recurring question: how long exactly can all this go on? So, don�t delay. It could well be your, never to be repeated, last chance. 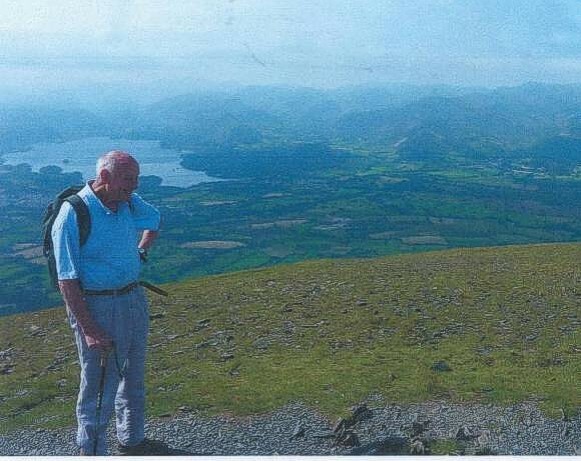 Sponsor me when on my eighty third birthday, on the 11th of August, I propose to go up Skiddaw in aid of Fusion Caf� and Young at Heart. At the summit enjoying birthday cake and champagne, �Happy Birthday� songs in English and Polish. Andr� Zaluski, Alison Watson and a small team of friends. 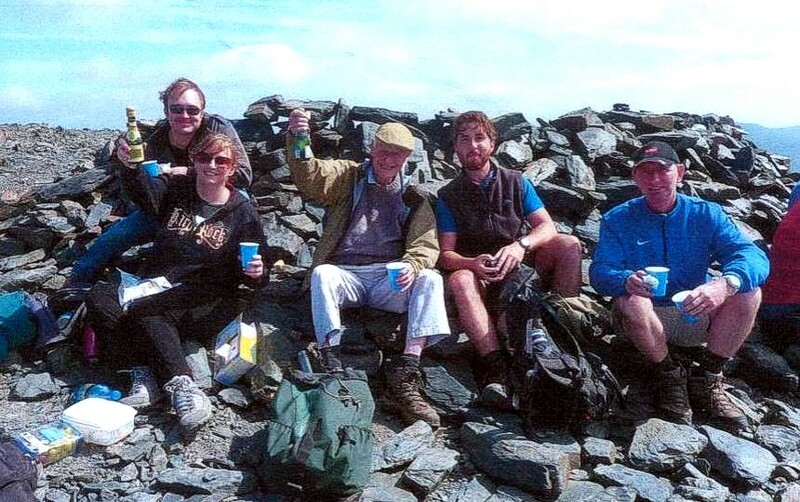 Andr� had decided to climb this hill to celebrate his birthday and to raise money for Fusion Caf�. Fusion Dementia Caf� supports people with dementia and their carers. The climb taking in Little Man peak took them over two and a half hours with the round trip, which covered 6.61 miles, taking four hours and twenty minutes. 1 Francis Cook, 1935 � 2012, was a British Independent politician. He was the Labour Party Member of Parliament for Stockton North from 1983 � 2010.